Bodh Gaya emerged as a centre that encouraged a continuous dialogue of civilisation, it has enabled India to re-forge her age old linkages with countries, who derived inspiration from Buddha’s message of compassion. It is this dialogue that was sought to be interrupted by the dastardly attack, says Dr Anirban Ganguly. Bodh Gaya, its radiating serenity and its message of peace, has been for millennia one of the principal civilisational anchors of the Indic civilization. It was therefore heart wrenching to witness such a senseless attack being perpetrated on what has unarguably emerged as a great symbol of mankind’s effort to transcend itself towards something higher and nobler. 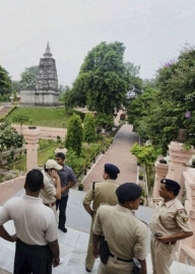 The perpetrators of last Sunday’s attack on one of the most ancient sanctum sanctorum of Buddhism and one which is indelibly linked to Gautama Buddha’s quest for enlightenment is a severe affront to humanity’s sense of self, its quest for global harmony and in particular to India’s civilisational spirit and to her spiritual identity. Towards the end of his short life Vivekananda again came to Bodh Gaya on the morning of his 39th ninth birthday, it was his way of paying his spiritual obeisance and farewell to one who had been for him mighty sea of inspiration. The other legendary Chinese pilgrim, Xuanzang (Huen Tsang) who had come to India in search of wisdom described how the Bodhi tree withstood all heretic onslaughts and each time miraculously bounded back to life. Every time its roots were damaged, it sprouted life again. Xuanzang recounts how king Purnavarma surrounded the sacred tree “with a wall of stone 24 feet high” so that no one could cut it down. To the east of the Bodhi tree, Xuanzang saw a Vihara, “160 or 170 feet high.” The building was of ‘blue’ bricks and covered with ‘chunam’ and ‘all the niches in different storeys’ held ‘golden figures’ and the four sides were covered with ‘wonderful ornamental work’. The vicinity thus of the Bodhi tree, which has been hallowed by the footsteps of the enlightened one, can never be really defiled by a bunch of terrorists. The Bodhi tree has withstood greater onslaughts in the past. The mighty Asoka, after he had “consecrated ten years went out to Bodh Gaya” to pay his homage to Buddha. It was an act symbolic of his progress towards enlightenment. Nearer our times Bodh Gaya has acted as a vibrant bridge for India to reach out to her civilisational neighbours in Southeast Asia. As a continuing centre of pilgrimage Bodh Gaya emerged as a centre that encouraged a continuous dialogue of civilisation, it has enabled India to re-forge her age old linkages with countries and people who have always derived great inspiration from Buddha’s message of compassion. It is this dialogue, this ceaseless discovery of a greater cultural and spiritual self beyond constricting political boundaries that was sought to be interrupted through the dastardly attack on Bodh Gaya. Bodh Gaya continues to symbolise such a quest and act as a beacon of compassion in a violent and hate ravaged world. Dr Anirban Ganguly is director, Dr Syamaprasad Mookerjee Research Foundation, New Delhi.